We have many emotions. At different times, you may be happy, sad, or jealous. Anger is a natural human emotion that can vary in intensity from mild annoyance to irritation to rage and fury. We all have experienced anger at some point in time. The problem is not anger; but its mismanagement. Mishandled anger and rage is the major cause of conflict in our personal and professional relationships. Domestic abuse, road rage, workplace violence, divorce, and addiction are just a few examples of what happens when anger is mismanaged. When anger turns to aggression it can be destructive to self and other as well. So what is the difference between anger and aggression? It's perfectly OK to be angry at times. But anger must be released in the right way. Otherwise you'll be like a pot of boiling water with the lid left on. If the steam doesn't escape, the water will finally boil over and blow its top! Anger management is not about getting rid of anger, but letting go of it in way that will not harm you and others. Anger management is also about consciously choosing to replace aggression with assertiveness, improved communication and joint problem solving. 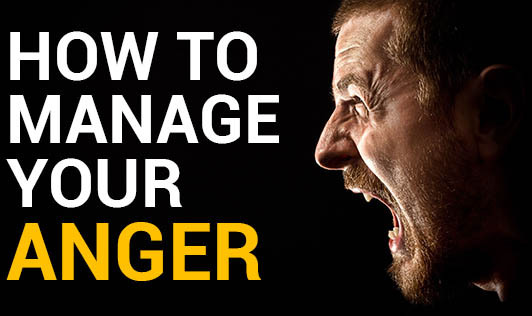 Take the Anger management Quiz to test your anger management skills! Keeping a check on your anger! • What triggers your anger? • How do you perceive the situation? • How do you cope when you get angry? • Patterns - Do you see things repeating themselves? • The cost you have paid when you've lost your temper. • Know what pushes your buttons. • Know your body's warning signs. • Consciously relax and calm down when you notice these warning signs. • Be aware of your thoughts. Don't act without thinking. • Stop and think - what else can be done? • Stick to the issue while interacting. Try not to bring up issues from the past. • Remove yourself from the situation if necessary. For instance, if you feel that while there, you cannot control yourself, make the effort to go somewhere else for a while and calmly think things through. • Logic defeats anger. Think and reason out the issue instead of letting it get the better of you. • Replace aggression with assertion. Instead of getting aggressive, stand up for your rights and what you deserve. You can do this by examining your communication pattern. • Look at your gains from negotiation, rather than loses. • Remind yourself of safer channels to let go of anger. For some people, reading a book, listening to music, taking a walk, painting and so on work. Figure out what works for you and try it next time to release your pent up anger. Don't bottle the anger in. • De-Stress. Especially over the weekends. Find activities to do with your husband, catch up with friends. Find a way to relax that works well for you. • Lastly, do not forget to forgive. If you don't forgive a person for what's done wrong, you'll hold on to the anger for a long time.